Attorney General William Barr’s letter to congressional leaders on Friday afternoon notifying them special counsel Robert Mueller had finished his investigation into Russian interference in the 2016 election may be opening act in a protracted political battle over the probe’s conclusions. 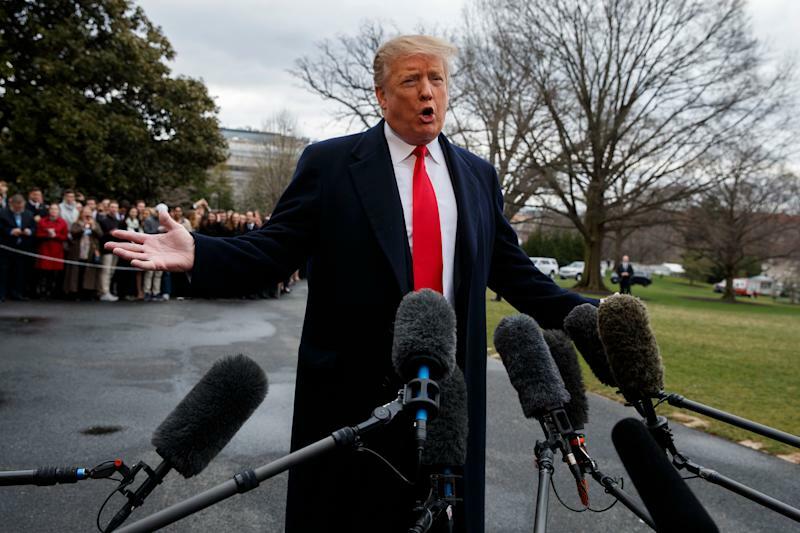 In the wake of Barr’s letter to the Senate and House Judiciary committees confirming that the probe was complete, multiple Democratic presidential candidates swiftly issued statements calling for the immediate release of Mueller’s report. “As Donald Trump said, 'Let it come out.' I call on the Trump administration to make special counsel Mueller's full report public as soon as possible. No one, including the president, is above the law,” said Vermont Sen. Bernie Sanders. “Here’s what must happen now. We need total transparency. A declassified report must be made public immediately, and all underlying investigative materials should be handed over to Congress. Attorney General William Barr must also testify under oath before Congress about the findings of this investigation,” Harris said. 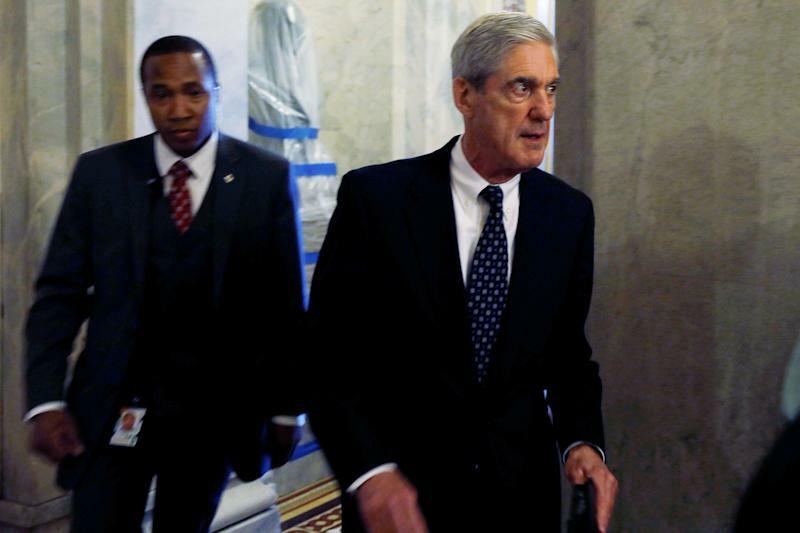 Mueller’s investigation has captured the attention of the country and President Trump, who has repeatedly dismissed it as a “witch hunt.” Although Trump and his allies have attempted to paint the probe as a partisan attack on the White House, the president’s opponents have eagerly awaited the conclusion of the investigation in the hopes that it will bring damaging revelations about the Trump campaign’s dealings with Russia. Trump has repeatedly insisted there was “no collusion” between his campaign and the Kremlin. 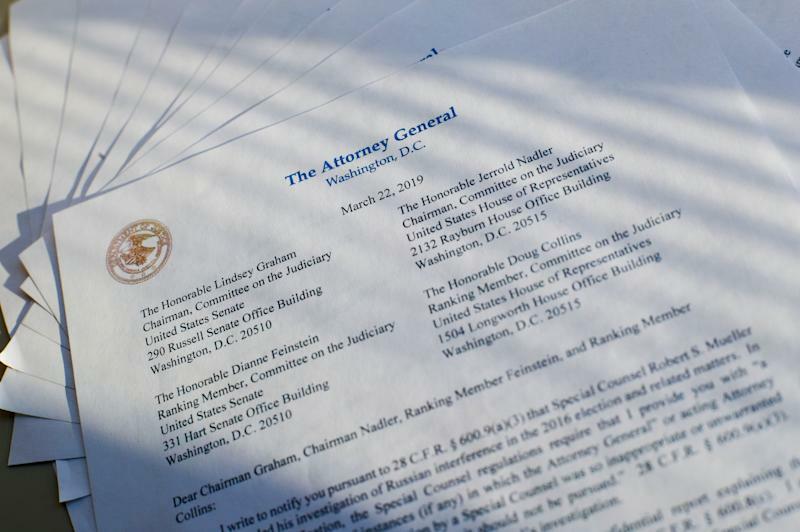 The special counsel regulations required Mueller to submit a confidential report to Barr and called for the attorney general to notify the congressional Judiciary committees. According to the rules, Barr can decide what, if anything, from Mueller’s report will be made public. “I intend to consult with Deputy Attorney General Rosenstein and Special Counsel Mueller to determine what other information from the report can be released to Congress and the public consistent to the law,” Barr wrote in his letter. Mueller’s probe has resulted in a slew of indictments and multiple convictions against a variety of targets, including Russian nationals affiliated with that country’s intelligence agencies and former members of the Trump campaign. Allegations in a series of indictments documented evidence that Russian government agents stole emails and data from Democrats and the Clinton campaign and then disseminated those messages publicly via Guccifer 2.0, a Romanian hacker persona of their own creation, and WikiLeaks. Along with spreading the stolen emails, Russian agencies worked to distribute agitprop online during the 2016 race. Mueller’s indictments referenced some contacts between the Russian conspirators, disguised in their hacker persona, and an outside affiliate of the Trump campaign, Roger Stone, but those contacts have not yet been shown to be incriminating. The recent indictment of Stone for lying to Congress and intimidating witnesses also alleged that he coordinated with the Trump campaign, which was eager to learn about the content and planned WikiLeaks release of the Democrats’ stolen emails. However, this behavior has not been charged as or shown to be a crime. The prosecutors on Mueller’s team also won convictions against Trump’s ex-campaign chairman Paul Manafort and the president’s former longtime personal attorney, Michael Cohen, in a separate series of indictments. The charges against the two men stemmed from their personal finances and, in Cohen’s case, false statements to Congress about a Trump real estate project in Moscow. Other guilty pleas secured by Mueller’s prosecutors have shown that Trump associates lied about key interactions they had with Russians. George Papadopoulos, a Trump campaign foreign policy adviser, admitted he lied about an approach he received from a shadowy Maltese professor and his Russian associates and they discussed the possibility of a meeting between then-candidate Trump and the Kremlin. The professor also told Papadopoulos that the Russians had thousands of Clinton emails, which constituted “dirt on her.” Although the factual narrative that accompanied Papadopolous’s guilty plea detailed his discussions within the campaign about a potential meeting with Moscow, it did not describe the extent to which Clinton’s emails were discussed within Trump’s team. Michael Flynn, another campaign foreign policy adviser who would go on to serve as Trump’s first national security adviser, admitted to lying about his coordination with a Russian official on sanctions relief and a vote at the United Nations after the campaign was over. Additionally, Flynn admitted that he lied about his work for Turkey during the campaign. Ultimately, although Mueller revealed a number of contacts between Trump associates and Russia during the campaign, he never charged them as part of a conspiracy or revealed to what degree the Trump campaign was involved in those efforts. That central lingering question is one of the reasons Mueller’s report has been so highly anticipated. As the probe unfolded, there was turmoil within the Justice Department that led to doubts about who would oversee Mueller and whether the president’s allies might interfere with his work. The investigation began in the wake of a January 2017 U.S. intelligence community assessment that concluded the Russian government intervened in the 2016 election in order to boost Trump and hurt his Democratic Party rival, Hillary Clinton. That report did not indicate that Trump’s campaign cooperated with the effort. Mueller was subsequently appointed to lead this investigation in May 2017 by Deputy Attorney General Rod Rosenstein. Former Attorney General Jeff Sessions, who was appointed by Trump, recused himself from the probe due to his involvement with the Trump campaign and contacts with Russia’s ambassador to the United States during the 2016 election. Along with regularly blasting the Mueller probe, Trump repeatedly criticized Sessions’s decision to recuse himself. Trump’s anger led to lingering tensions that culminated in his request for Sessions to resign last November. Sessions was replaced on an acting basis by his former chief of staff, Matthew Whitaker, who had openly criticized the Mueller investigation. Eventually, Barr, who had also criticized the Mueller probe, was confirmed as attorney general. Democrats raised concerns about both Whitaker and Barr’s oversight of the investigation due to their past critiques of it. Those worries were amplified by reports that Trump sought to have Justice Department leadership derail attempts to investigate his campaign. Now, with the investigation complete, the White House and Trump’s legal team indicated they were comfortable leaving the fate of the report in Barr’s hands. “The next steps are up to Attorney General Barr, and we look forward to the process taking its course. The White House has not received or been briefed on the special counsel’s report,” said White House press secretary Sarah Sanders. “Attorney General Barr will determine the appropriate next steps,” the statement said. The one person who has not, so far, made a public statement about the investigation’s conclusion is Trump. The president has not tweeted about the conclusion of the Mueller probe — for now.